(Dallas, TX) June 1, 2016 – Encore Hospitality, LLC a subsidiary of Dallas-based Encore Enterprises received two awards from Marriott International for properties in Alabama and Mississippi. Encore’s Courtyard Biloxi North/D’Iberville located in D’Iberville, Mississippi was awarded the title of Platinum Hotel for 2015. To achieve this title the hotel ranked in the top five percent of all Courtyard hotels for guest satisfaction in 2015 according to Marriott International guest satisfaction surveys. 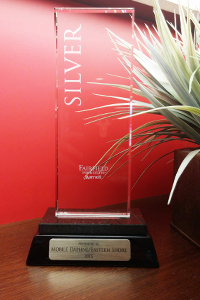 Encore’s Fairfield Inn & Suites Mobile Daphne/Eastern Shore located in Spanish Fort, Alabama received the Silver Circle Hotel award for 2015 which ranks it in the top 15 percent of Fairfield Inn & Suites hotels for Guest Satisfaction according to Marriott International guest satisfaction surveys from 2015. Encore Hospitality, LLC is a subsidiary of Encore Enterprises, Inc., and was founded in 1999 as a fully integrated, hospitality acquisition, development and asset management company focusing on the upper mid-priced, nationally branded select-service and full-service hotel sector. Encore Enterprises, Inc. is a privately owned national real estate investment company founded in 1999 with corporate headquarters in Dallas, Texas. Encore develops, acquires, and manages hotels, multi-family communities, retail shopping centers, and commercial offices.